The Tambov military garrison prosecutor has told Kommersant charges have been lodged against Sergey Sidorenko, deputy commander of a unit at the elite Lipetsk pilot training center. Sidorenko and others allegedly extorted 3 million rubles of premium pay from other officers at Lipetsk since the beginning of 2010. According to Senior Lieutentant Igor Sulim, who wrote about the situation at Lipetsk in his blog in May, the training center’s chief of staff, Colonel Eduard Kovalskiy and his deputy Sergey Tereshin organized the scheme, and Sidorenko carried it out. Sulim maintains the entire leadership of the unit [center?] and local law enforcement knew about the extortion racket. After Sulim went public, investigators substantiated his accusations, and the Defense Ministry reportedly began to check premium pay distribution in other military units. During the Defense Ministry’s check for similar problems elsewhere, the only other situation to receive press attention was a case involving some Black Sea Fleet aviation units. See Komsomolskaya pravda and Novyy region. In decrees published today, President Medvedev accepted the retirement of EW Directorate Chief, General-Major Oleg Ivanov. Part of the “troyka” of retiring generals, he reportedly requested retirement for health reasons. No official documents yet on the other two (Andrey Tretyak and Sergey Skokov). The press covered the news on General-Major Ivanov, but didn’t note the promotion of General-Major Bondarev to be Chief of the Main Staff, First Deputy CINC of the VVS. Bondarev was the Main Staff’s investigating officer in the case of Senior Lieutenant Sulim and the Lipetsk premium pay kickbacks. The VVS and Defense Ministry must not be unhappy with his work, which consisted mainly of berating and pressuring the officers forced to pay tribute to their superiors. In any event, the decrees . . .
General-Major Vladimir Aleksandrovich Filatov, Deputy Commander, 2nd Army. General-Major Sergey Vasilyevich Chvarkov, Chief, Main Directorate for Personnel Work, RF Armed Forces, relieved as Deputy Chief, Military Art Department, Military Academy of the General Staff, RF Armed Forces. General-Major Oleg Anatolyevich Ivanov, Chief, Radioelectronic Warfare Troops, RF Armed Forces. General-Major Aleksey Ivanovich Nesterov, Chief, 3rd Directorate, Main Organization-Mobilization Directorate, General Staff, RF Armed Forces. General-Major Anatoliy Grigoryevich Predius, Chief of Military-Space Academy named for A. F. Mozhayskiy Branch (Cherepovets, Vologda Oblast). General-Major Viktor Nikolayevich Bondarev, Chief of Main Staff, First Deputy CINC, Air Forces, relieved as Deputy CINC, Air Forces. Colonel Vladislav Yevgenyevich Kharchenko, Chief, Radioelectronic Warfare Service, Eastern MD. The story of Igor Sulim and the premium pay scandal is like the 19th century one about Russian society’s generation gap. With liberals and nihilists reversed. In Sulim’s story, the fathers are old senior and mid-grade officers who span Soviet and Russian worlds. They have no problem taking whatever’s not nailed down. The sons are post-Soviet junior officers, reared on the Internet, familiar with Western-style justice and rule-of-law, and ready to demand an end to corruption (that costs them money). Perhaps your author reads too much into this. Or just maybe there’s some truth in this description. Let’s review some new details first. The investigation into Senior Lieutenant Sulim’s accusations is a very slow roll. Rolling the victims. Here’s an update on the action (or inaction?). Sulim posted his first video on May 31. Gorod48.ru wrote about it. Sulim explained why he felt he had to complain to Defense Minister Serdyukov and go public about corruption in his unit despite the military’s “corporate ethic” against it. He said he exhausted other avenues and had no other resource at his disposal. He didn’t intend to be a one-man campaign against corruption but he’s getting support, and hearing similar stories, from others. And he thanks his fellow officers supporting him despite the difficulties and pressure they face. He concludes speaking out is his civic duty. Russians should unite around one idea and struggle together so Russia doesn’t lose its greatness and remains a great power. And so the next generation doesn’t hate the current one for being silent and patient, believing nothing will ever change. It’s not revolution or spilled blood he wants, but the path of civilized development. On June 2, Moskovskiye novosti wrote that Sulim predicted a disciplinary reprimand and deprivation of his premium pay would come his way for going over his superior officers (and, in fact, both came pretty quickly). The “army Navalnyy” and other officers are being pressured in every way by the authorities, and the entire Lipetsk center’s been deprived of premium pay to turn other officers against Sulim. He was removed from flight status. Public Chamber member Anatoliy Kucherena reported over half of 150 personnel he met said they were aware of the corrupt pay scheme at the base. Sulim gave Ogonek an interview. Sulim said his father was not happy about him going public, but Sulim stressed it was his own personal decision. General-Major Sulim’s being pressed to keep his son’s mouth shut. By mid-June, Sulim’s antagonists — Colonels Kovalskiy and Sidorenko — were both relieved of duty, but his supporters — Majors Kubarev and Smirnov — had been hauled before an Air Forces attestation commission in Moscow, called cowards for not refusing to pay kickbacks, and all but told they would be transferred from their elite Lipetsk duty, according to Komsomolskaya pravda. 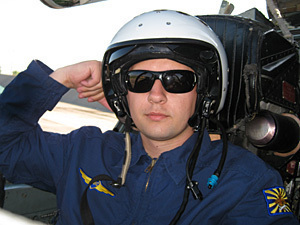 The paper points out Kubarev is a Su-34 pilot qualified for aerial refueling, and Smirnov was regiment’s top pilot last year. In Moskovskiy komsomolets, Olga Bozhyeva wrote that Sulim’s reprimand was for violating the law’s prohibition on “discussing and criticizing the orders of a commander.” The authorities apparently didn’t go after him for revealing some of the stupid things said and written by Deputy VVS CINC General-Major Viktor Bondarev. Instead, they focused on his criticism of the Defense Ministry’s anticorruption orders posted on his blog. For its part, MK posted new audio clips indicating that the even the local FSB is in on getting kickbacks at Lipetsk, and this didn’t happen just in the 3rd Squadron, but all over the center. Bozhyeva asks, if this happens in an elite formation like Lipetsk, what happens in less prestigious units? There is lots on Sulim’s blog. Most recently, he wrote about meeting with VVS Deputy CINC, General-Lieutenant Sadofyev, who asked him why he had to “create a scandal.” Of course, Sulim’s made the point many times that he tried to go through the chain, through channels, and to do it without blood, and quietly. But Sadofyev and the older generation really don’t get it. The new Russian generation of sons might make even congenitally pessimistic observers of Russia a little hopeful. The authorities could be playing an ultimately futile game of whack a mole with an entire generation of Dymovskiys and Matveyevs and Sulims. Loss of Fear or Loss of Faith? Olga Bozhyeva has a great interview with the protagonists of the Lipetsk premium pay extortion scandal. Essentially, Major Smirnov and Senior Lieutenant Sulim detail a farcical investigation, and what looks like a wider-ranging criminal conspiracy. The entire Air Forces, not just the Lipetsk center, are in serious damage-control mode. Bozhyeva introduces the piece as showing that even elite units suffer from corruption, and points out the center’s chief, General-Major Aleksandr Kharchevskiy, gave Vladimir Putin a test flight, and led combat aircraft that overflew Red Square on Victory Day 2010. The two young aviators told her they had to talk immediately because time is against them. Smirnov described his experience with the extortion scheme. He said those refusing to pay got reprimands that could be used to force them out, and, with many officers being cut already, this threat was especially serious. Or, he says, higher-ups would simply take away their “400” pay, and give it to someone willing to pay tribute. Smirnov says the extortionists also collected as much as 240,000 rubles a year from conscripts. He also recalled seeing Sulim’s draft complaint about corruption, and agreeing to support the younger officer. 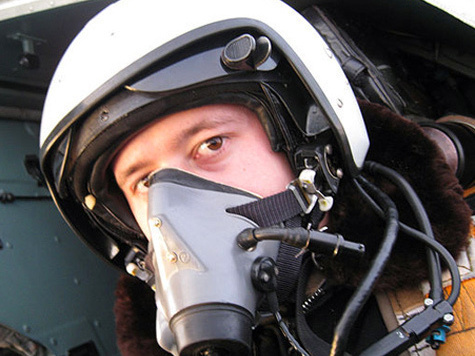 Their ex-squadron commander, Major Yevgeniy Kubarev, joined them. The VVS sent Deputy CINC, General-Major Viktor Bondarev to investigate, but, as Smirnov says, everyone who wanted to see him had to talk to the center’s Chief of Staff, Colonel Eduard Kovalskiy (the scheme’s ostensible organizer), Kharchevskiy, the new squadron commander (a Kovalskiy crony), zampolit (and bag man) Colonel Sergey Sidorenko, and FSB man Major Zatsepin first. Afterwards, Kovalskiy already knew all details of what they told the VVS investigator. Kovalskiy apparently talked to the father of one officer in an attempt to pressure him against supporting Sulim and Smirnov. The squadron CO reportedly told one officer, if he talked openly, he’d be the first dismissed. Sulim and Smirnov don’t accuse Kharchevskiy, but Smirnov says he’s afraid the extortion scheme goes higher, up to the VVS Glavkomat, because, if this involved just one colonel and one air group, it would’ve been cleared up quickly. Smirnov says he and Kubarev have sent their families away from Lipetsk, as a precaution. At the end, Bozhyeva asks Sulim and Smirnov what results they want from the interview.